Cinnamon truffles made of cinnamon-scented cream and deep, dark chocolate. After one taste of these, you may never go back to plain chocolate truffles again! 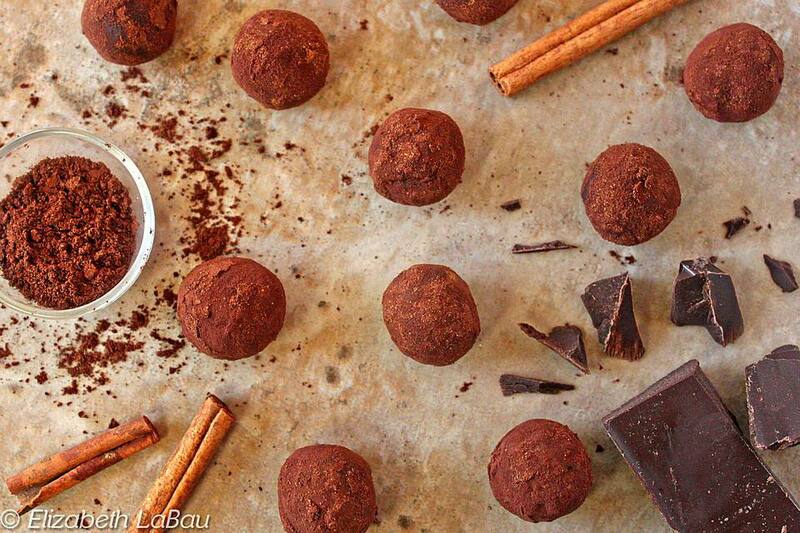 Try them and see how easy it is to make gourmet truffles at home. As an alternative to rolling them in cocoa, you could try dipping them in chocolate and topping them with a Red Hot or other cinnamon candy. Place the chopped chocolate in a large bowl and set aside. Combine the cinnamon sticks with the cream in a medium small saucepan over medium heat, and bring the cream to a simmer. Once simmering, remove the pan from the heat and cover it with a lid. Let it sit for 30 minutes to absorb the flavors. After 30 minutes, remove the lid, return the pan to the heat, and bring the cream to a simmer once more. Pour the hot cream through a fine mesh strainer into the chocolate bowl, straining out the cinnamon sticks. Allow the hot cream and chocolate to stand for one minute to soften the chocolate, then whisk the mixture gently until the chocolate melts and the mixture is entirely smooth. Add the room temperature butter and salt, and whisk them in. This is your ganache. Cover the ganache with cling wrap, placing the cling wrap directly on top of the ganache so that it is not exposed to air. Refrigerate the ganache until it is firm enough to scoop but not rock-hard, about 45-60 minutes. Mix the cocoa powder and cinnamon together in a shallow bowl. Dust your hands with cocoa powder. Scoop teaspoonfuls of ganache and roll them between your hands to make them round, adding more cocoa powder as necessary to keep them from sticking to your palms. Place the truffles on a baking sheet covered with parchment or waxed paper. Store Cinnamon Truffles in an airtight container for up to a week. They are best served at room temperature when their flavor and texture is the best.